A slender chin symbolizes beauty, confidence and grace…whereas, double chin, wattle, or gobbler, whatever you name it, robs us of those completely. In Australia, both men and women reckon that double chin makes a person appear unhealthy, overweight and old. A survey of Australians has purported that around 56% of women and 39% of men revealed that double chin makes them feel self-conscious and less attractive. And the most discomforting fact is that out of all the women who participated in the survey, 33% of women in their 20s have double chin. The same percentage of women in their 30s and 40s have double chin, which indicates that irrespective of age, any person may develop double chin. At Nitai Medical and Cosmetic Centre, we have a long history of helping people with our innovative double chin treatments. Many believe that double chin occurs due to overweight, but contradictory to that common belief, double chin might appear due to several other factors like old age, genetics, etc. The eclectic patient profiles with double chin and the extensive experience of our doctors have provided us an in-depth account of the double chin causes, concerns and treatment. What is double chin? What are the causes behind the occurrence of double chin? Due to certain factors, layers of unwanted fats accumulate under the chin creating an extra bulge there. This makes the face appear heavy and elderly. There might be many reasons behind the sudden appearance of double chin. Due to genetic influence, one might end up inheriting double chin. As a person matures, the facial shape of the person changes. That is a time when a person develops mostly. The most commonly known factor for double chin is being overweight. When a person puts on too much weight suddenly, then the chances of appearance of double chin increases. 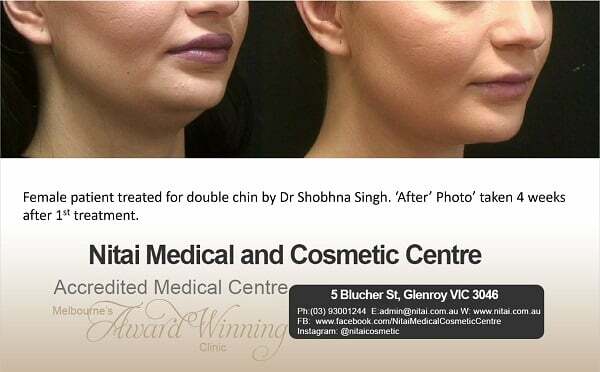 What is the effective double chin removal treatment used at Nital Medical and Cosmetic Centre in Melbourne? Even though there are numerous double chin treatments available in Australia, but most of them are very expensive and immensely painful. What most of our patient desire is to have a permanent double chin removal treatment that is both cost-efficient and less painful for them. And the non-surgical injectable treatment adopted by Nitai Skin Clinic aptly fits both the criteria. The double chin removal injections contain synthetically produced deoxycholic acid which dissolves the extra fat accumulating under our chin. Deoxycholic acid occurs naturally in our body, hence it exerts very minimal to negligible side-effects but very effective results. How does this double chin removal injection works? In this double chin treatment at Nitai Medical and Cosmetic Centre, a compound called deoxycholic acid is used to break down the fat molecules under the chin. Deoxycholic acid is a naturally available substance in our body that disrupts the fat molecules in our food. The artificially created deoxycholic acid is applied under the chin in a series of injections, which then slowly dissolves the excess fat content under our chin and the liquefied fat cells is later excreted from our body with the help of liver. Thus, this double chin treatment corrects the neck as well as jawline profile perfectly. Why choose this double chin removable treatment with deoxycholic acid over others? Compared to all the surgical double chin removal techniques and liposuction, deoxycholic acid double chin treatments are less painful and economical. The double chin treatment takes only 15-20 minutes to finish a session. Also, it requires a very small amount of downtime after the treatment. When done by a specialized cosmetic physician, it does not have any permanent side-effects. This treatment is very safe and can be customized as per the patient’s convenience and requirements. Once the complete treatment is over, the fat cells that have been treated do not regenerate and as a result, they do not cause double chin to reappear. How many sessions are required to be rid of double chin completely? 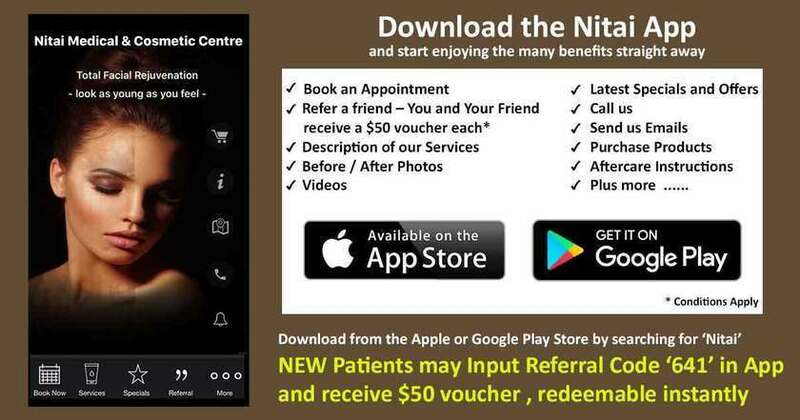 At Nitai Skin Clinic in Melbourne, we have witnessed remarkable changes in our patients after 2-4 sessions of the double chin treatment. But, for some, it might take more than that. So, we suggest up to 6 sessions to completely remove the appearance of double chin and acquire a slender neck and prominent jawline. Are there any side-effects of this double chin removal injection? In some severe cases, due to inefficiency in treatment or heightened sensitivity, the patient might experience uneven smile, trouble in swallowing, food apathy, sore at the injection site, sudden hair loss, or discolouration. We recommend to immediately seek the aid of your physician if any of those severe side-effects occur. What precautions are taken to avoid any kind of discomfort? Deoxycholic acid injections might create mild irritation or pain while applying the series of injections under the chin. Hence, prior to the treatment, cubes of ice or cold packs are applied to the treated area to avoid any kind of discomfort. Also, in certain cases, local anaesthesia is fused with the injectable liquid to diminish pain. Patients are also suggested to intake pain relievers before the procedure to sustain any sort of pain. Who are the ideal patients for non-surgical double chin removal injections? Double chin removal injections work miracle on anyone with fullness under the chin area. But, since this injection eliminates double chin by disrupting the excess fat layers, so ideal candidates are those whose layers of fat under the chin can be grabbed with the index and thumb finger. The patients with loose or sagged skin beneath the chin are not very ideal cases for this treatment. Nobody prefers swollen flesh under chin as it not only deforms the shape of the face, but it also spoils the grace of the neck and jawline. Earlier the removal of double chin via surgery or liposuction was a tad inconvenient. But, this innovative double chin treatment is hassle-free, safe and affordable. Embrace the double chin removal treatment at Nitai Skin Clinic and get your confidence, grace and beauty back! Previous Previous post: Why Dermal Fillers Are Getting So Popular Nowadays? Next How to prevent scarring after mole removal?